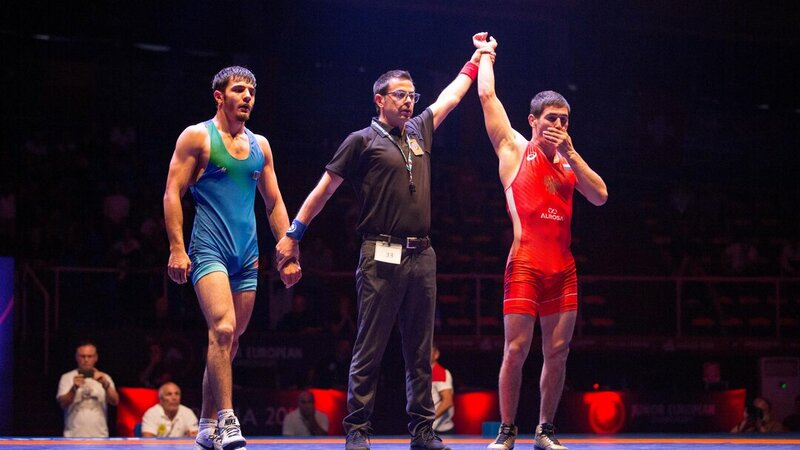 ROME, Italy (August 4) - After running through the Greco-Roman and women’s wrestling competition, Russia’s dominance trickled over to freestyle as they were able to capture two additional gold medals on the sixth day of competition at the Junior European Championships. 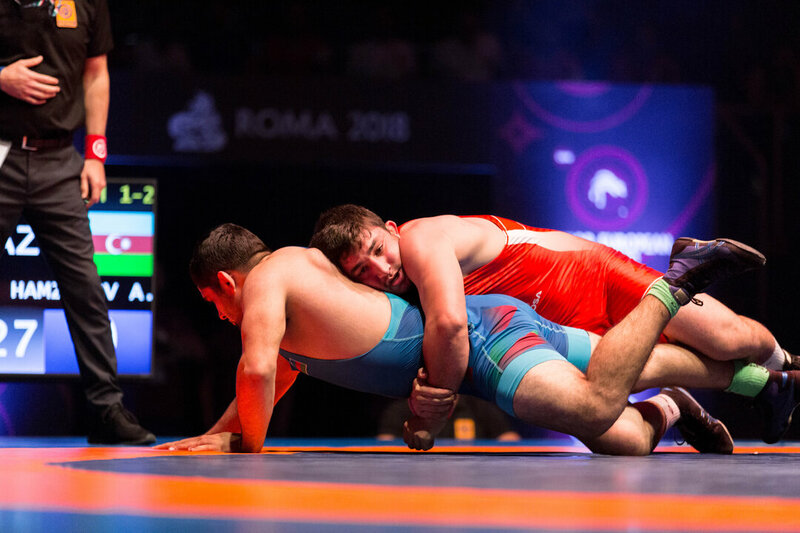 Thus far, eleven Russian wrestlers have enjoyed hearing their national anthem begin played while standing atop of the podium, and will have three more opportunities to hear it being played on the final day of wrestling in Rome, Italy. The duo of Aznaur TAVAEV (RUS) and Chermen VALIEV (RUS) each seized gold medals, helping Russia command the team lead heading into the seventh day of competition. In the 65kg finals, Aznaur Tavaev walloped 2014 cadet world bronze medalist, Nicolai GRAHMEZ (MDA), picking up the 15-4 technical superiority victory to pocket his first continental championship. Tavaev trailed early after surrendering a takedown and an exposure but was able to erase the four-point deficit, taking the 4-4 lead on criteria into the second period by picking up a takedown and exposure of his own. The Russian exploded in the second period, scoring four-points off a defensive chest-wrap, followed by a failed Moldova challenge to take the imposing 9-4 advantage into the final minute of the match. After another defensive scoring sequence, Tavaev closed the match out with a snap-down spin-behind to a trapped-arm gut-wrench, ultimately winning 15-4. 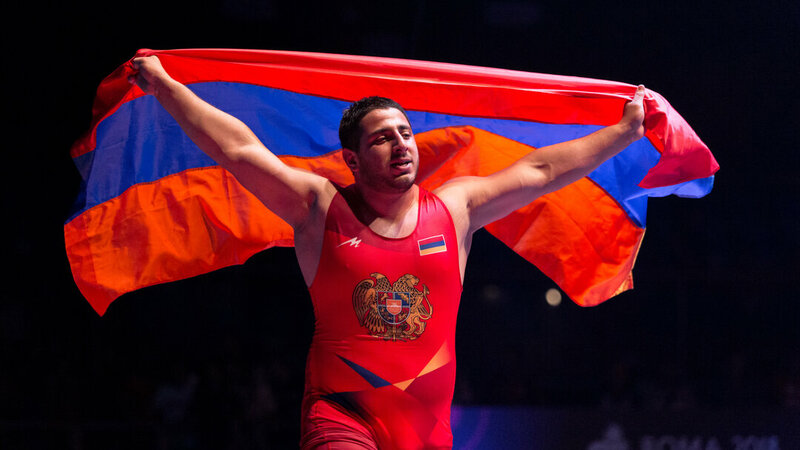 Chermen Valiev used a pair of second-period takedowns to narrowly escape Khadzhimurad GADZHIYEV (AZE), 5-3 in the 70kg gold-medal bout. 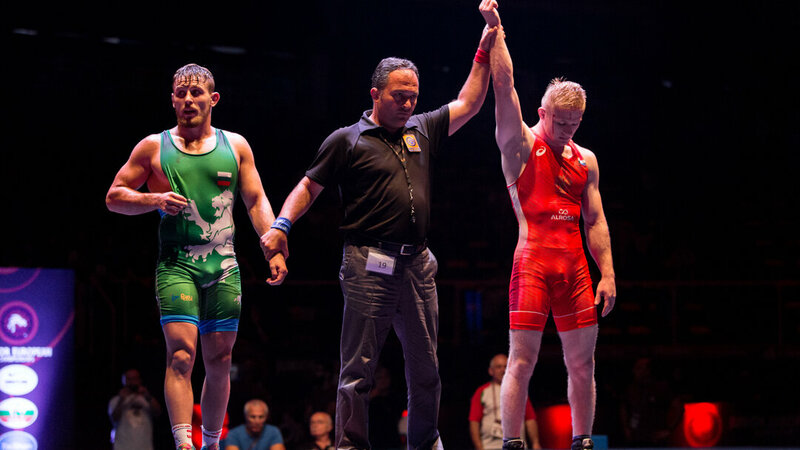 In the opening period, Valiev, the 2014 Cadet World team representative picked up a step-out point before conceding a takedown and a step-out to fall behind 3-1. Valiev rebounded in the final period and snatched the two-point lead with a pair of takedowns. The 2017 Ivan Yarygin runner-up narrowly held on to present Russia their second gold medal of the day and eleventh overall. Three other Russians will have the opportunity to compete for gold tomorrow, as the competition wraps up with the final freestyle medal match session starting at 6:00 PM (local time).